We track mandatory corporate actions for you and provide the list here. Where we can, we add details that we have received. Please note that many of these actions evolve over time and additional details will be added as we receive them. We received news some time ago that Volkswagen AG (OTC: VLKAY) has terminated its ADR program as of August 13th, 2018. As a result, there was no longer a liquid market for VLKAY and the shares have since stopped trading. JP Morgan—acting as the depositary—has sold the securities represented by VLKAY and has distributed the proceeds. As a result, all holders of the ADR have received $34.90 per share held. Please review the distribution in your Stockpile account. We received news that Luxottica Group S.p.A., which is listed over-the-counter under the ticker symbol “LUXTY”, has stopped trading as of market close on Friday, March 22nd, 2019. As a result, all holders of the LUXTY ADR have received $55.89 per share. The distribution is already reflected in your Stockpile account. Levi Strauss & Co is public today! The company has conducted an initial public offering of its common stock on the New York Stock Exchange under the ticker symbol “LEVI”. Don’t forget to place an order today by 3:00PM ET if you wish to own Levi Strauss & Co (NYSE: LEVI) on its first public trading day! Can I purchase LEVI through my Stockpile account? Yes, we are happy to announce that Stockpile customers are able to purchase LEVI on its first day of trading. Can I purchase LEVI at IPO price? Since Stockpile facilitates trades between investors and the secondary market, we are unable to provide LEVI at the IPO price (between $14.00 and $16.00 per share); however, all orders will still be filled as it is normally filled—on market-on-close price. We received news that Beneficial Bancorp, Inc. (Nasdaq: BNCL) has been acquired by WSFS Financial Corporation (Nasdaq: WSFS) as of March 1st, 2019. Under the terms of the merger, all BNCL holders have received a cash payout at a rate of $2.93 per share and a stock payout at a rate of 0.3013 shares of WSFS common stock per share of BNCL owned. Your Stockpile account already reflects these distributions. For more information, please see the following press release: WSFS Financial Corporation Completes Acquisition of Beneficial Bancorp, Inc. Please note, there is a $50.00 fee charged to make an election if the conversion value of your shares is greater than $100. Participation is this offer is completely voluntary as you are not required to make any election. If no election is made, the default election will be deemed to be the mixed election. For more information on the offer, please see the following press release: II-VI Incorporated to Acquire Finisar, Creating Transformative Strategic Combination with Leading Positions in Photonics and Compound Semiconductors If you would like to participate in the offer, please respond to this email with your election by May 14th, 2019. We received news that Eli Lilly and Company (NYSE: LLY) is offering to divest its remaining interest in Elanco Animal Health (NYSE: ELAN) as of February 8th, 2019. The exchange offer is designed to permit Lilly shareholders to exchange their shares of Lilly common stock for shares of Elanco common stock at a 7% discount, subject to an upper limit of 4.5262 shares of Elanco common stock per share of Lilly common stock. If the upper limit is not in effect, for each $100 of shares of Lilly common stock accepted in the exchange offer, tendering shareholders would receive approximately $107.53 of Elanco common stock. If you would like to participate in this offer, please take a moment to review the terms and details of the offer here: Lilly Will Initiate Divestiture of its Remaining Interest in Elanco Animal Health. We have received news that Eli Lilly and Company (NYSE: LLY) is offering to purchase all outstanding shares of common stock of Loxo Oncology, Inc. (NASDAQ: LOXO) at a purchase price of $235.00 per share. If you wish to participate in the offer, simply respond to this message by February 11th, 2019. We recently received notice that InterContinental Hotels Group PLC (NYSE: IHG) has undergone a reverse stock split at a rate of 0.95. We received notice that CenturyLink, Inc. (NYSE: CTL) has announced a voluntary program through which shareholders on the record date of December 14th, 2018, owning fewer than 100 shares of CTL common stock may conveniently sell all their shares or purchase enough additional shares to increase their holding to 100 shares. We recently received notice that iPath S&P 500 VIX ST Futures ETN (VXX) is scheduled to mature in January 30, 2019. Since you are a holder of the note, we just wanted to give you a friendly reminder that VXX is due to mature in the near future. Until then, you are free to sell the stock in the secondary market. If no action is taken by the maturity date, you will receive a cash payment in U.S. dollars per ETN equal to the applicable closing indicative value on the final valuation date. We recently received notice that Sonic Corp. (NYSE: SONC) has been acquired by Inspire Brands, a private multi-brand restaurant company, as of December 7th, 2018. As a result, all common stockholders have received a cash distribution of $43.50 per share of SONC owned; in addition, the SONC stock will no longer be trading. We have received notice that ETE and ETP have completed their previously announced merger. As a result, all holders of ETF has received 1.28 common units of ETE. In addition, ETE has changed its name to Energy Transfer, L.P. (NYSE: ET)—thus, ETP and ETE have ceased trading and will now be trading under the new symbol, ET. We recently received notice that Syntel, Inc. (SYNT) has been acquired by Atos S.E. As a result, all common stockholders have received a cash payout of $41.00 per share of SYNT owned; in addition, the SYNT stock will no longer be trading. 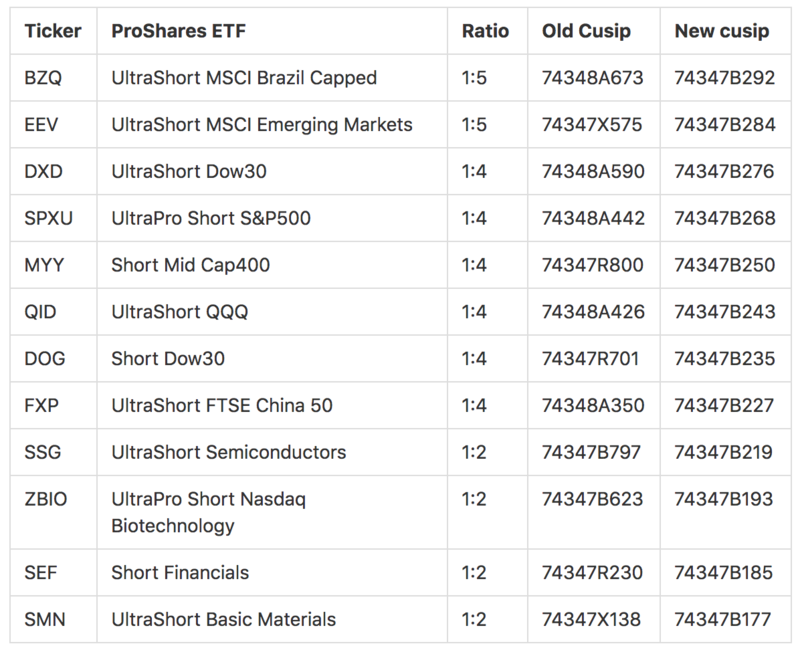 We were recently notified that the ETF ProShares Short VIX Short-Term Futures (SVXY) has undergone a 1:5 reverse split. For example, for every five shares of UVXY owned pre-split, investors will receive one share of UVXY post-split. You should already see the new, post-split shares of UVXY in your account. We were recently notified that the ETF ProShares Short VIX Short-Term Futures (SVXY) has undergone a 1:4 reverse split. For example, for every four shares of SVXY owned pre-split, investors will receive one share of SVXY post-split. You should already see the new, post-split shares of SVXY in your account. We recently received notice that XL Group Ltd (NYSE: XL) has been acquired by AXA. As a result, all common stockholders have received a cash payout of $57.60 per share of XL owned; in addition, the XL stock will no longer be trading. All cash distributions should already be reflected in customer accounts. We have received notice that ILG, Inc. (ILG) has been acquired by Marriott Vacations Worldwide (NYSE: VAC) as of September 1st, 2018. All ILG stockholders will receive $14.75 in cash and 0.165 shares of VAC common stock for each share of ILG common stock owned. You should already see the distributions in your account, and no further action is needed on your part. For more information on the acquisition, please see the following press release: Marriott Vacations Worldwide Completes Acquisition of ILG, Inc.
GGP (GGP) is performing a cash merger. At the end of trading on Monday, August 13, Volkswagen AG terminated its sponsored ADR program. VLKAY shares are no longer trading as there is no liquid market for this ADR. Stockpile is no longer accepting or able to fill trades on VLKAY due to the lack of a market for the shares. Current Stockpile clients holding VLKAY ADR will only be offered the default cash option. On or after February 11, 2019 JP Morgan, acting as the depository, will sell the securities represented by VLKAY and distribute the proceeds for the pro rata benefit of the registered holders of the VLKAY ADR that have not be surrendered. Foundation Medical (FMI - F017956) - Shares of Foundation Medical were purchased by Roche for $137.00 in cash. Quality Care Properties (QCP) performed a cash merger. Shareholders will receive $20.75 cash per 1 share held. If you own 250 shares you now have 1 share. We anticipate the shares may arrive in the next 2-3 business days. Stockpile accounts will be updated with the special cash dividend and the stock symbol change to KDP on July 13, 2018. Voluntary Corporate Action - Frequently makes less sense for Stockpile customer given the small size of position and $50 Reorg fee assessed by APEX. Time Warner stock ceased trading as of the close of business June 14, 2018. Holders of Time Warner stock will received Cash 53.75 & Stock @ 1.437 of ATT (symbol: T). Layne Christensen Company (NASDAQ: LAYN) ("Layne" or the "Company") announced that its merger with Granite Construction Incorporated (NYSE: GVA) ("Granite") has now been completed. As a result of the transaction, Layne's common stock will no longer be traded on the Nasdaq Stock Market, effective immediately. One share of Layne shares are being exchanged for 0.27 Granite shares. Bayer completed the acquisition of Monsanto on June 7, 2018. Bayer is now the sole owner of Monsanto. RATE: @ $128.00, one share of Monsanto would receive $128. Fractional shares will receive the cash equivalent to their fractional share. 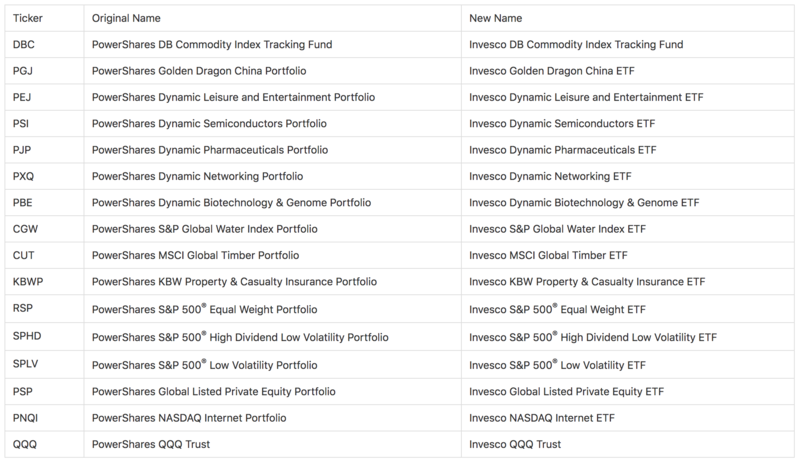 Starting June 4 the follow "Original Name" ETF's will change to the Invesco branded under the "New Name" column. CUT and DBC will be added as new securities as these ones added by a position transfer. The below securities will undergo reverse splits effective 5/24. On the evening 5/23, investor accounts will be adjusted overnight with new positions. Any reports that are created prior to the adjustment will not reflect the post-split positions. The trading symbols will not change. The below securities will undergo forward splits with an ex-date of 5/24. The accounts will be adjusted with the split shares on the morning of the ex-date.